Modern health care experts know that a patient's blood pressure is a good indicator of how healthy a person is. A high blood pressure reading indicates stress and possible heart problems. The blood pressure device we use today has its roots in seventeenth-century England. William Harvey (1578-1657) did pioneering work on blood circulation in the 1600s. During his studies, Harvey noted that blood pulsated (beat or throbbed) out of a severed artery as if it were under rhythmic pressure. Nearly a century later, Stephen Hales (1677-1761), an English cler-gyman and physiologist, continued those studies. Hales devised a method to measure the pressure exerted on the blood vessels as blood was pumped through them. He inserted a brass pipe into an animal's blood vessel and used the flexible windpipe of a goose to connect the pipe to a long glass tube. The height to which the animal's blood spurted up into the tube gave a measure of the pressure on the blood. One of Hales' most dramatic experiments using this simple manometer involved a white mare, tied flat on the ground to a stable door. The glass tube in this instance was 12 feet, 9 inches (3.8m) long, and the horse's blood rose in it to a height of 9 feet, 6 inches (2.9 m). Hales began his blood pressure measurement experimentation around 1706, continued around 1712-1713, and finally reported his technique in his 1733 book Haemastaticks ("Blood Facts"). It took another century before the Hales manometer was improved upon. In 1828 French physician Jean Leonard Marie Poiseuille (1797-1869) replaced the long glass tube with a U-shaped tube filled with mercury. The tube was calibrated in millimeters of mercury to record pressure levels. The German physiologist Karl Friedrich Wilhelm Ludwig modified Poiseuille's manometer in 1847. He added a revolving cylinder and float with a revolving drum on it. By attaching a pen to it, the blood pressure levels could be recorded on this kymograph. In 1863 Etienne-Jules Marey created a better recording machine he called a sphygmograph. All of the blood pressure devices developed up to the 1870s required that the blood vessel be penetrated for the pressure to be taken. It took Samuel Siegfried von Basch (1837-1905), a German physician, to come up with the sphygmomanometer in 1876. This device was the first to measure pressure without piercing the skin. His device was replaced in 1896 by a sphygmomanometer made by Italian physician Scipione Riva-Rocci (1863-1937). This device was the prototype of today's standard instrument. 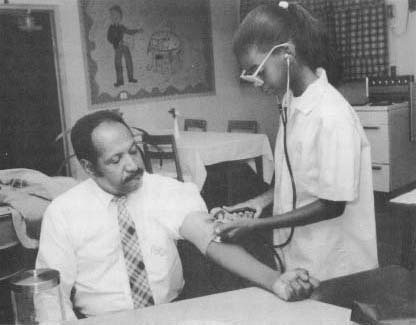 A young girl uses a modern blood pressure measuring instrument. Today, home versions of this device are widely available. It used an arm band which could be inflated until the blood flow through the arteries could no longer be detected. Air was then released from the band. The blood pressure was measured on a mercury manometer at the moment when the pulse reappeared. Riva-Rocci's instrument was accurate. The only problem was that it measured only systolic pressure (pressure within the artery when the heart is contracting). Russian physician, Nikolai Korotkoff added the missing element in 1905 when he suggested that a stethoscope be used to listen to the blood flow. Heard through the stethoscope, the tapping that begins when air is released from the band is the systolic pressure. The moment the tapping sound disappears is the diastolic pressure (pressure between contractions while the heart is at rest). Wide clinical use of blood pressure measurement using the sphygmomanometer was promoted by American surgeon Harvey Williams Cushing. Standard readings were soon established and became basic indicators of heart and lung health or problems. Today, home blood pressure devices are widely available and in use, with a mercury tube, a circular needle gauge, or an electronic display to give readings. When did blood pressure measurements become routine in European hospitals?